Every Wednesday, we offer tips via Twitter to help you with your profession. Below are tips we tweeted last month. Click on the tip to view the original source. Take advantage of holiday gatherings to network and build relationships with people from different departments, especially if you have an interest in transferring to that department. If your job isn’t perfect use it to strengthen your skills, develop your brand, and build your network – take that leap and step outside your comfort zone. If your job frustrates you, stop making excuses and start looking for a new opportunity. Know the criteria used to determine who receives a work bonus – it may or may not be clearly stated. 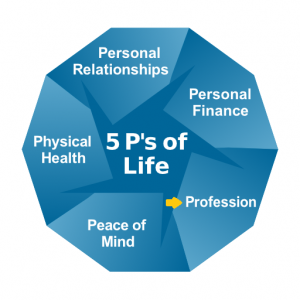 One of the 5 P’s of Life is “Profession” – your work. It’s what you do for a living – whether you work for a company or self-employed. If you’re not satisfied with your work-life, then take control and make changes. Set goals for this aspect of life by stretching your skills and expanding your network.